Welcome to the Downloads Page at ChessRally.com! Here you will always find the latest and greatest downloads for ChessRally 2! NOTE: If you have any trouble with downloading or installing ChessRally, then please contact Ingenuware Support at http://www.ingenuware.com/support for assistance. We will do our best to help you resolve any download or installation problems you may encounter, so if you're having download or install problems, then don't give up! Let us help you! Description: Download new themes (Chess Sets, skins, and sounds) for use with ChessRally 2, all versons. Description: The Theme Creator's Kit allows you to create your own themes for ChessRally. The ChessRally 2 Theme Specification is fully detailed in this kit, and comes with sample graphics. NOTE: The kit is not software, but rather documentation on how to create themes. This documentation is very complete, so much so, that at first it is daunting. Please take the time to read through it all, very carefully, and if you need help understanding anything, feel free to contact us about it. 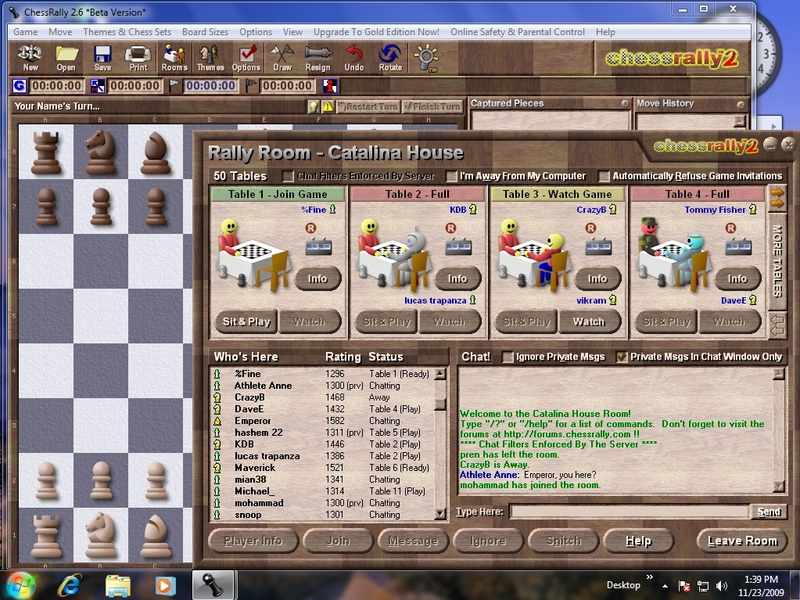 Description: ChessRally 2 Rally Room Server allows you to host your own Private Rally Room Server. Ideal for LANs (Local Area Networks) and fast Internet connections. Just install it, give people the Host Name/ IP address and port number, and you can host a private chat & game party. (Note: This Rally Room Server software is somewhat technical in nature, and is for experienced users only.) Added in 2.3 and up are the capability for Room Monitors, and enhanced heuristic chat filters. Added in 2.45 are new Room Operator support commands, and a new silence to offer a "kinder" disciplinary action (instead of kick/ban) & auto-silence feature to prevent chat window flooding/scrolling. IMPORTANT NOTE: THIS VERSION IS NOT COMPATIBLE WITH CHESSRALLY 2.5 OR HIGHER. IF YOU REQUIRE A COPY OF CHESSRALLY v2.49 IN ORDER TO UTILIZE YOUR OWN PRIVATE RALLY ROOM SERVICE, PLEASE CONTACT US AT support@ingenuware.com AND INQUIRE. Description: The complete source code for the port of the Crafty engine as used in ChessRally as a Dynamic Link Library (DLL). Includes a sample VB project on how to use the DLL. THIS SOURCE CODE IS NOT THE FULL SOURCE CODE TO THE CHESSRALLY PRODUCT, BUT JUST THE CRAFTY DLL PORT, WHICH IS LICENSED UNDER THE GNU PUBLIC LICENSE WITH PERMISSION FROM THE ORIGINAL AUTHOR OF THAT COMPONENT, AND IS NOT SUPPORTED BY INGENUWARE. AN ADDITIONAL PROTECTIVE LICENSE IS ALSO PROVIDED. Basically, use at your own risk! Check back for new downloads Often! !